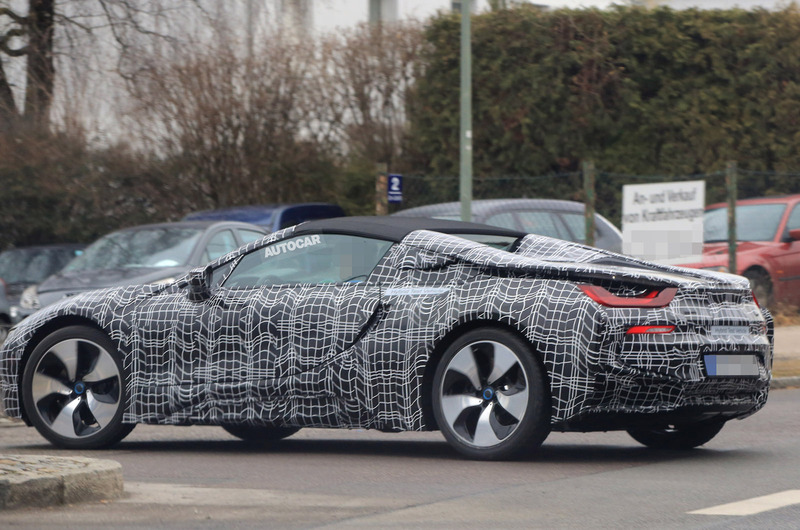 BMW has offered another official glimpse of its i8 Roadster, which will be launched alongside a facelifted version of the coupé early next year. It's also expected to make its official debut at the LA motor show later this month, as BMW has announced that the car is in its final stage of testing. A video posted on social media (see below) previously showed the car wearing camouflage and confirms that it will retain the dihedral doors of its hard-roof sibling. Both the Roadster and hard-top variants of BMW's plug-in hybrid Porsche 911 rival will receive aesthetic and mechanical updates, while the starting price is expected to increase slightly. The external updates will include new headlights with a more intricate LED design, while the Roadster will swap the standard i8’s tailgate for a pair of buttresses behind the driver and passenger, adding more visual drama. These have been adapted from the look of the BMW i Vision Future Interaction concept of the 2016 Consumer Electronics Show (CES). The Roadster's soft-top must be removed manually and stowed away. The open-top model's design is likely to make it heavier than the i8 coupé, which currently weighs 1560kg. The new i8s are expected to get a 10% power hike from an upgraded petrol-electric hybrid powertrain, taking power up to 420bhp, about 5bhp less than the turbocharged 3.0-litre straight six that powers the BMW M3. The i8s are powered by a turbocharged 1.5-litre three-cylinder petrol engine combined with a front-mounted synchronous electric motor. Interior upgrades are expected as well, with BMW's latest iDrive infotainment system with gesture control technology likely to be adopted. The i8 coupé currently costs from £106,310, but the facelifted model is expected to have a slight price increase. The Roadster will be priced above the coupé, so a starting price of more than £110,000 is probable. The updated i8 range will come soon after BMW's i electric car sub-brand launches a hot version of the i3. The i brand's models will benefit from a new business deal with Intel and Mobileye to help development of autonomous vehicles. The latest BMW 7 Series and BMW 5 Series both have semi-autonomous driving capabilities, and upgrades to the latest i8 could also include the hybrid inheriting this technology. The i8 and Roadster will eventually be joined by the iNext, which is due in 2021. That car will have autonomous capabilities up to Level 3.5, which will allow full driverless travel in certain environments. Well I have to say.........! I have seen a few and it looks great,a spyder version is fine,gives Audi R10 a run for it's money!? In the roof design. Very hi-tech. Nice and light though. Is that a reference to the 1996 Lotus Elise soft top roof? Ferrari had a folding soft top targa roof panel available for the 348 TS back in 1990 - 4 years before the Elise was even conceived! "The new i8s are expected to get a 10% power hike from an upgraded petrol-electric hybrid powertrain, taking power up to 420bhp, about 5bhp less than the turbocharged 3.0-litre straight six that powers the BMW M3." So thank how nice it would be if they fitted said engine instead? 200+k lighter but keeping relatively modest wheels and tyres. Junk the boring interior and fit something a bit more McLaren and all you need to do is find some room for luggage and it's a winner. ...So thank how nice it would be if they fitted said engine instead? 200+k lighter but keeping relatively modest wheels and tyres. Junk the boring interior and fit something a bit more McLaren and all you need to do is find some room for luggage and it's a winner. That does sound like an appealing alternative, but McLaren like interior? McLaren interiors are among the dullest/drabbest in the business, especially considering the prices of their cars. I'd take i8's interior, even as it is, over any McLaren's every time. So thank how nice it would be if they fitted said engine instead? 200+k lighter but keeping relatively modest wheels and tyres. ....and all you need to do is find some room for luggage and it's a winner. Of course just replacing a 1.5 with a 3.0 straight 6 isn’t that simple, bigger fuel tank, rads, uprated gearbox, exhaust system, etc. Meaning your weight saving of 200+kg is based on NO fact then there’s either installation of a 4WD system etc. The spyder's manual roof is an option under the iAssist label. is certainly about lightness with high voltage! LP in Brighton, I think if you look at the i8's construction, you'll find its pretty leading edge in terms of currently volume manufacturable technology, what would you suggest BMW do to improve it's weight saving measures ? After two years of running my i8, I still find it the most fascinating and enjoyable car I've ever had, performance/economy are a step on from anything else, and for what it is, it very good value, even better to a second hand buyer. The only downsides for me are that it's very wide for UK B Roads, but they have to fit the batteries somewhere, and the luggage space is very compromised, but it does effectively have to accommodate two "engines", two fuel sources and all the accompanying control systems. Worst feature by far is having to step into an awful BMW Dealership, and suffer their lacklustre "service".